African American women have always made huge contributions in civil rights, science, technology, business, politics and even sports. Some of them are well-known like Harriet Tubman and Coretta Scott King, but too many others have gone unnoticed over the years. Their accomplishments, however, have dated back into the early 1800's and continue into modern day. #1 - Tiffany Haddish: In 2017, she made a hilarious debut appearance on Saturday Night Live and became the first Black woman standup comedian to ever host the show in the show’s entire history. #2 - Ava DuVernay: In 2016, she became the firt Black woman to direct a film with a $100 million budget when Disney hired her as director of A Wrinkle in Time based on the best-selling novel. #3 - Gwen Jimmere: In 2016, she became the first and only African-American to hold a patent for a natural hair care product. Her company, Naturalicious, produces an entire collection of popular all-natural hair care and skin care products. #4 - Angel Rich: In 2017, she became the first Black woman to develop a mobile app that was downloaded more than 200,000 times in two weeks. She also became the first Black woman ever that Forbes called "the next Steve Jobs". #5 - Essynce Moore: In 2017, she became the only African American teen author that has written three books that are mandatory readings for several school district curriculums. Her books are a part of a series that she created called The Middle School Chronicles. #6 - Tia Norfleet: In 2017, she became the first Black woman to be licensed by NASCAR as a professional race car driver. 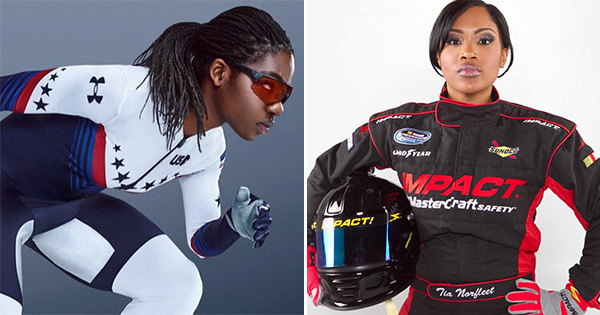 She is also the first Black woman to be licensed by ARCA, the Automobile Racing Club of America. #7 - Vanessa Braxton: In 2018, she became the first African-American woman to own a nationally distributed vodka. Her company, Black Momma Vodka, offers various unique flavors of handcrafted, gluten-free vodka for women... but still strong enough for any man. #8 - Maame Biney: In 2018, at just 18-years old, she became the first Black woman ever to join the U.S. speedskating team for the Winter Olympics. The competition took place in Pyeongchang, South Korea. #9 - Melissa Harville-Lebron: In 2018, she became the first Black American woman to own a NASCAR team franchise. Her team, E2 Northeast Motorsports, is the first multicultural team to race competitively in NASCAR. #10 - Esther Mahlangu: In 1991 and again in 2016, this South African artist and entrepreneur became the first non-Western and first Black woman to design artwork on a BMW car. #11 - LaToya Cantrell: In 2018, she set a significant milestone as the first woman ever to become the mayor of the city of New Orleans, Louisiana in its entire 300-year history. She started out as a community organizer when the city was hit by Hurricane Katrina in 2005. #12 - Dr. Hadiya-Nicole Green: In 2016, this physicist and college professor became the first Black woman to ever win a grant of more than $1 million dollars for science research. She used the funding to help develop laser technology that kills cancer cells.